AFC Rushden & Diamonds welcome back skipper Richard Bunting for tomorrow’s (Saturday) trip to Ware in the Evo-Stik Southern League Division One Central. Bunting is back in the squad for the trip to Hertfordshire after sitting out the opening two matches through suspension following his red card against Cogenhoe in the final match of last season. And Liam Dolman could also be back to boost a defence that leaked a late equaliser at St Ives Town in midweek after goals from Tom Lorraine and Tommy Berwick had put Diamonds on course for a first win of the campaign. Dolman missed the match on Tuesday night with a calf injury picked up in the opening minutes of the draw with Petersfield Town last weekend. Diamonds boss Andy Peaks said: “Liam could be okay. Bunting made 31 appearances in Diamonds’ UCL Premier Division- winning side last season and comes into a squad that has made a solid start to their first campaign in the Southern League with draws against Petersfield and St Ives. 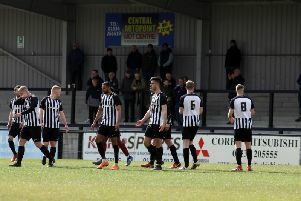 Peaks has targeted the play-offs this season and said: “I’ve seen nothing in the first two games that makes me think we can’t have a good season. “We have had two decent performances and could have had six points. We should have at least four. “We gave away a cheap goal at St Ives and that’s taught us we have to stay focused for the full 90 minutes. “We can’t be giving away cheap goals like that. Ware are also new to the Southern League and from their opening two matches, they have taken one point. In midweek, they were beaten 2-1 at home by Potters Bar Town.